Collagen is the main protein component of skin, tendon, bone, and blood vessels. Vascular injury exposes collagen fibrils in the subendothelial layer. Platelets bind to the exposed collagen either directly or via the von Willebrand factor. Manufactured collagen products, prepared as sheets or a loose fluffy powder, enhance platelet aggregation in the area of bleeding and clot formation by prompting localization of endogenous coagulation factors and by stimulating fibrin deposition. Collagen further adds to hemostasis by activating the intrinsic pathway. Hemostatic action of collagen requires an intact coagulation system with functional platelets and clotting factors (Table 1). Therefore, collagen has little effect in patients with inactivated platelets (e.g., aspirin) or compromised clotting pathways (e.g., heparin and coumadin). 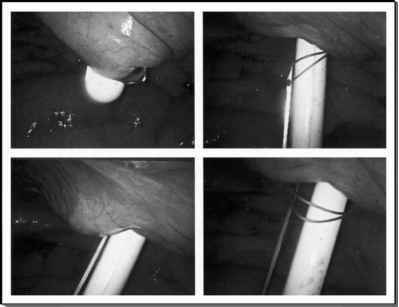 Avitene sheets of bovine-derived collagenq are cumbersome laparoscopically because of being brittle and difficult to deliver into the insufflated abdomen. As such, the use of collagen sheets is limited. The powdered collagen preparation is more amenable laparoscopically because it can be blown through a large diameter catheter. EndoAvitene™q is a novel product specifically designed for laparoscopic use. The preloaded collagen can be applied through a 5 mm port and may be used in conjunction with thrombin, which can be dripped or sprayed over the deposited collagen.